Manitoba Hal believes the ukulele is a mighty instrument… and despite its small size and only four strings… it’s perfect to play the blues. Over the past fifteen years Manitoba Hal Brolund has forged an international reputation for engaging performance, storytelling and masterful ukulele playing. His strong foundation in American roots / blues music, confident expressive vocals, and distinctive original music have made him a solid draw and in demand workshop leader at festivals, house concerts and soft seat theatres in Canada, the United Kingdom and Australia. Hal’s performances are all about engaging and connecting with his audience and he makes music that takes his audience from the deep-south to the islands with songs that are mournful, hopeful, silly, romantic and introspective. 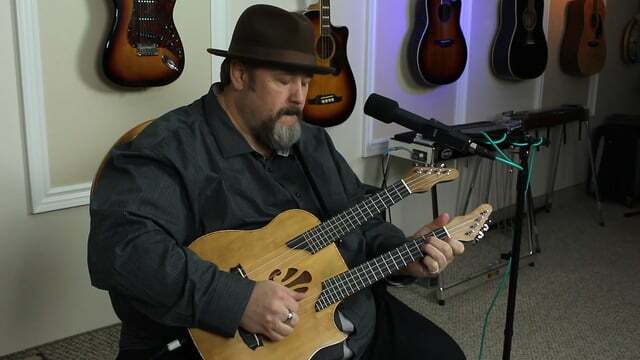 He proves that the uke can be small but mighty as he pulls out powerful blues riffs and melodies adding background beats with looping technology showcasing the blues in all it’s passion and groove.